And they played like gods, too! During their week-long retreat at Weatherwatch Farm, the trio prepared the huge new program for the upcoming concert season: Rachmaninoff Trio No. 1 in G Minor, Élégiaque; Brahms Piano Trio No. 2 in C major, op. 87; and Tchaikovsky’s monumental Piano Trio in A Minor, op. 50. We were privileged to hear their first public performance of the new program on Sunday, August 21st at the Saranac Methodist Church, with its splendid acoustics and fine piano. The ensemble had obviously delved deeply into these rich and complex works. They were keenly and passionately committed to each other and to the music, which was note- and phrase-perfect, in full comprehension and context of the overall arc. Each musician a stunning virtuoso in his own right, the whole was far “greater than the sum of its parts.” The audience sensed that they were witnessing something rare and exciting – the energy was palpable, exhilarating. After a moment of stunned silence at the conclusion of the Tchaikovsky, they jumped to their feet in a thunderous eruption of applause, an acknowledgment of their appreciation and affirmation of the power of live performance. 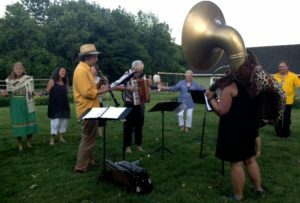 The Hills Were Alive With the Sounds of…….Balkan Music! 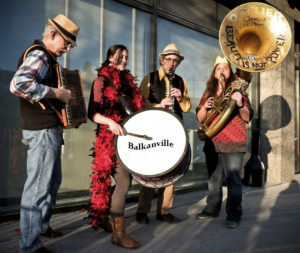 Posted in Uncategorized	| Comments Off on The Hills Were Alive With the Sounds of…….Balkan Music! 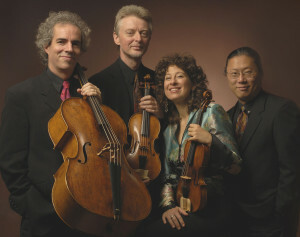 The core four-members of Rebel, the exemplary baroque music ensemble named after the French composer Jean-Féry Rebel, gave a sparkling performance at the Methodist Church, those members being Jörg-Michael Schwarz and Karen Marie Marmer, violins; John Moran, cello; and Dongsok Shin, harpsichord. Their exquisite program, entitled Barocco: Musical Treasures of the 17th and 18th Centuries, included sonatas by Corelli, Telemann, Rossi, Marini, Gabrieli, Bach, Goldberg, Boyce, and Vivaldi. Owing to the extensive reach and longevity of Rebel’s reputation, a veritable crowd of 120 turned out, a lot of new faces among them – always an encouraging sign! When the final notes sounded, the audience jumped to their feet to express enthusiastic appreciation for a unique and exciting live music experience. 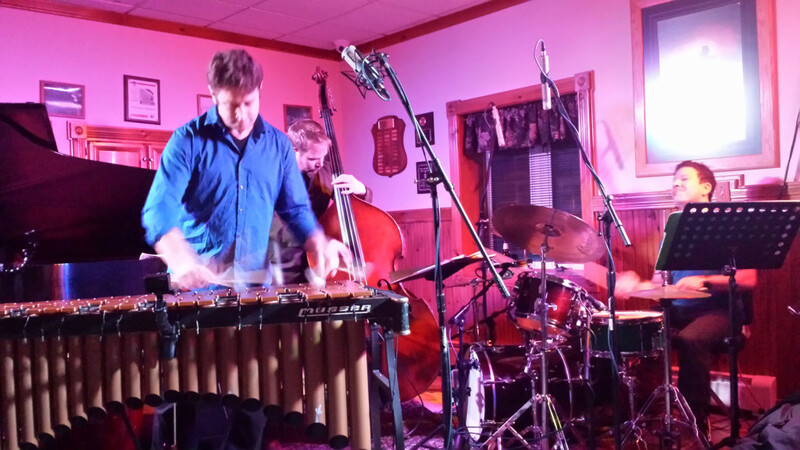 Tim Collins USA Jazz Quartet performed three shows at the Saranac Fire Hall February 12-14, each to a capacity crowd that appreciated a great groove and responded with warmth on a frigid weekend. Tim’s originals fleshed out the first half and peppered the second half of mostly standards. His music is melodious and lyrical and the not-overly-extended improvisations struck a fine balance of intellectual challenge and comprehensibility. Pure listening pleasure ruled in a funky-hip jazz club ambience. 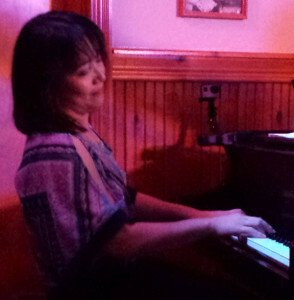 The elegant pianist Ayako Shirasaki came up from New York for the shows and the tight rhythm section came from Vermont with upright bassist Robinson Morse and drummer Gabe Jarrett. It was a charismatic ensemble that clicked from the get-go and became more cohesive with each show, and left you hungering for more playing into the night…… The concerts were a touching memorial to three beloved members of our community recently passed: Tim’s father Bob Collins, his grandmother Helen Schmidt, and trombonist, educator, and friend Rick Davies. Let’s hope we don’t have to wait another ten years before Tim organizes another great ensemble! We had a terrific turnout for the Concert of Piano Quartets by Patricia McCarty and Friends. We had been a little concerned because it is a challenge to market a no-name ensemble, even when the players are as pedigreed as these. Fortunately, the astute folks from both print and broadcast media recognized that this was no ordinary ad hoc ensemble and they put the word out – hooray! 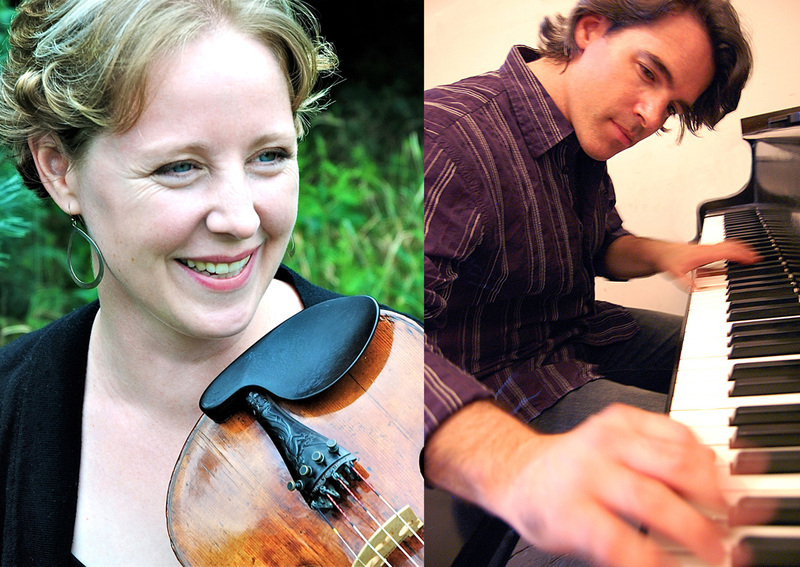 The Adirondacks can claim one of the pre-eminent violists of our day in Patricia McCarty. She persuaded some of her friends – each a renowned soloist and ensemble player – to join her in a special chamber music collaboration. Their thrilling and deeply satisfying program included Mozart’s Piano Quartet in E flat, K. 493; Fauré’s Piano Quartet No. 2 in G minor, Op. 45; and Brahms’s Piano Quartet in A major, Op. 26. The audience recognized that they were witness to a unique musical chemistry and responded with multiple standing ovations. It was a transporting heavenly experience! 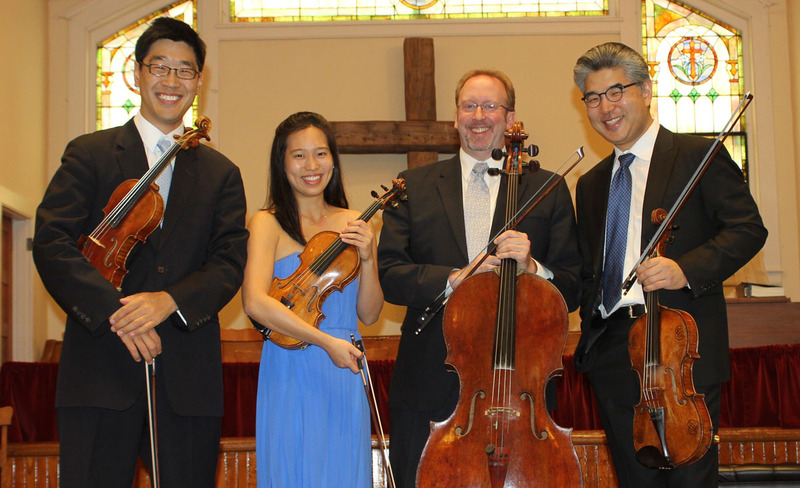 No surprise that the church was chockablock packed for the Johannes Quartet’s concert Sunday October 25 – over 250 in the audience, with overflow onstage seating “Lincoln Center-style” – in the choir! The community came out en masse to hear our beloved Soovin Kim. He played like an angel — his violin sang sweetly and soared loftily. 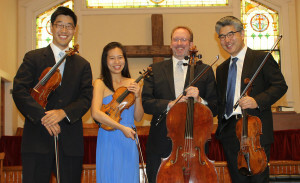 It was an exciting performance also because it was the debut for the quartet’s new second violin Julianne Lee. The program gave her good opportunity to impress all with her skill – no shrinking musical violet she! Esa-Pekka Salonen’s Homunculus opened the concert. 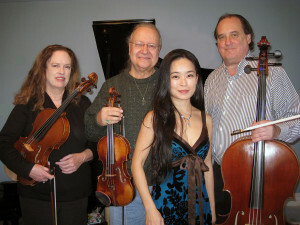 Written expressly for the Johannes Quartet, it is a mightily challenging work, but they have been performing it for eight years now and it has become internalized to such a degree it seems a force of nature, its intensity throbs and surges with relentless sweeping energy and power – totally exciting! 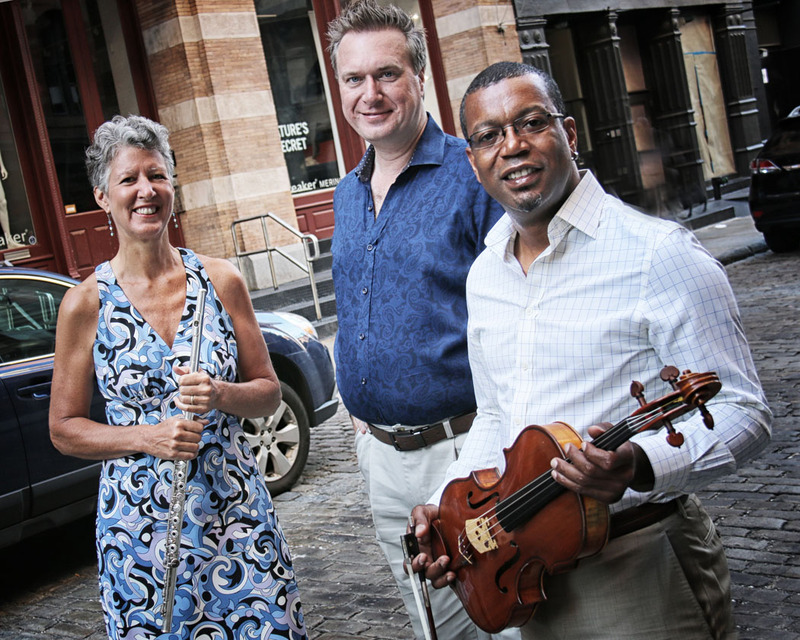 New York City-based musicians of the Emerald Trio work in New York’s vibrant music-theater scene, appearing in the orchestras of the hottest shows on- and off-Broadway. The Emeralds are Karen Bogardus, flutes; Orlando Wells, violin and viola; and Matt Castle, piano and composer. The Emerald Trio had an intense week of rehearsing and recording, swimming, rehearsing and recording, drinking wine, and rehearsing and recording. Their retreat was all about a program of new works written especially for them by their friends: on-the-scene New York City composers Carolyn Steinberg, Matt Castle, Joseph Pehrson, Gene Pritsker, Dan Cooper, Milica Paranosic, and Davide Zannoni. 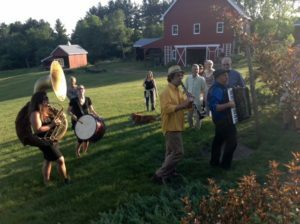 They capped their stay with a terrific performance of those fascinating works – free and open to the public – on Sunday, August 23 at the historic United Methodist Church in Saranac. Before long we expect the release of their new CD produced by Composers Concordance Records on the Naxos label. Gretchen Koehler is an elegant fiddler — her classical violin training shines through, yet her style is totally idiomatic. She performed in several distinct fiddling styles: New England, Bluegrass, Québec, Cape Breton, to name a few. She explained and demonstrated the essential rhythmic distinctions between, say, a jig and a reel… jiggity-jig, jiggity-jig and huckleberry, huckleberry! Gretchen has found an improbable music partner in New York City-based jazz pianist Daniel Kelly. His accompaniments provide an unexpected sonic environment and nudge her outside the usual framework of traditional folk. A couple of times he launched into extended jazz improvisations. An excellent musical marriage, and a totally delightful concert! We would be remiss if we did not mention who stole the show a couple times. Gretchen’s 13-year-old son Syl joined in with his own fiddle on “Devil’s Dream” and then jumped up altar-level for some spectacular step-dancing – bravo! 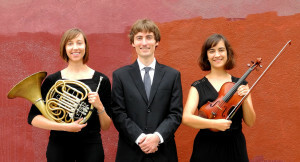 The Red Hedgehog Trio concluded their two-week retreat with a delightful concert that featured works for solo keyboard and violin-piano duo, as well as for the rather unusual instrumental combination of horn-violin-piano trio. J.S. Bach’s exquisite Partita No. 1 in Bb Major (BWV 825) opened the program, followed by John Harbison’s mysterious and atmospheric “Twilight Music” for Horn, Violin and Piano. Brahms’s lyrical Sonata No. 2 in A Major for Violin and Piano, Op. 100 led into the second half. The fourth and fascinating final segment of the program was “10 X 10” ─ 10 New Miniature Trios by 10 Composers, a collection of ten very brief works (each under two minutes in length) written by ten different composers for their trio. The Red Hedgehogs conceived and developed this project for the 10 X 10 Upstreet Arts Festival, a collaborative arts festival held annually in Pittsfield, MA. This effort represents a first step towards building new repertory for the ensemble of horn-violin-piano – a worthy cause. More power to them! Ricochet Duo – Jane Boxall on marimba and Rose Chancler on piano – delighted the crowd with their program DANCES (May 3, 2015). The unconventional instrumental pairing by two dynamic artists creates an enchanting new sound-world with a tantalizing repertory. DANCES is an appealing array of short works, including traditional rags by Harry Breuer and tangos by Astor Piazzolla, Igor Stravinsky, and Lucas Guinot. Contemporary dance-inspired works include “Exposed Zipper” and “Trans Fatty Acid’s Rein” from Tight Sweater Remix by Marc Mellits, “Old Adam (Two Step)” by William Bolcom, “Dance of the Octopus” of Red Norvo, and Pleiades Dances of Takashi Yoshimatsu. “Jovial Jasper” and “The Whistler” by the legendary American xylophonist George Hamilton Green elicited squeals of delight!